Photo Booths at wedding receptions let’s guests of all ages capture great memories. GRAB SOME PROPS & HAVE SOME FUN! Nothing breaks the ice at a wedding reception like a photo booth. A fun backdrop, a few blush-inducing props and you’ll have friends and family mingling in front of the camera. Add a Photo Booth to your wedding reception & let your guests of all ages capture some great memories to take home. In addition, give them the option to share via social media, text, and/or email. Photo Booths have many styles & options to choose from that accommodate different tastes & budgets! Photo Booths are completely digital. YOUR NAMES on the main screen of the booth welcoming your family and friends! There is a Touch-Screen interface with customizable graphics. Photo Booths are equipped to save every photo individually, as well as the strip that came out of the photo-slot. You can get a digital copy of all photos & videos (usually an additional option) taken in the booth. The new full length interactive Mirror Booth features a sleek design & user friendly interface. It allows your guests to get to see themselves in front of a full length mirror before they have their picture taken. Then they sign it, and choose to print, text, or email their photo to themselves. How about a Social Media Booth! iPad operated it lets everyone text or email their Boomerangs, GIF’s, or photos directly to their phones. Instanly sharing onto social media. There are still the Traditional Coney Island style booth where guests grab a prop, pull the curtains behind them and strike a pose. They then collect 2 photo strips from the booth to keep or put one in the bride & groom’s scrapbook. Above all, they take the scrapbook home at the end of the reception. Open Air booth features a red carpet & stanchions along with a standard or custom step & repeat backdrop! Most photo booths have social media, video capabilities, and printing station as an additional option. Your guests can leave a 30 second video for the bride & groom. With many options to choose from including type of props, scrapbooks, and custom backdrops, you can personalize the photo booth for your wedding reception. Some other additional options include; Scrapbook w/ Attendant, Double Prints, Acrylic Frames, Memory Poster, Additional Hours, Customized Front Magnet, Custom DVD Slide Show, External Video Monitor, Personal Audio Greeting, etc. 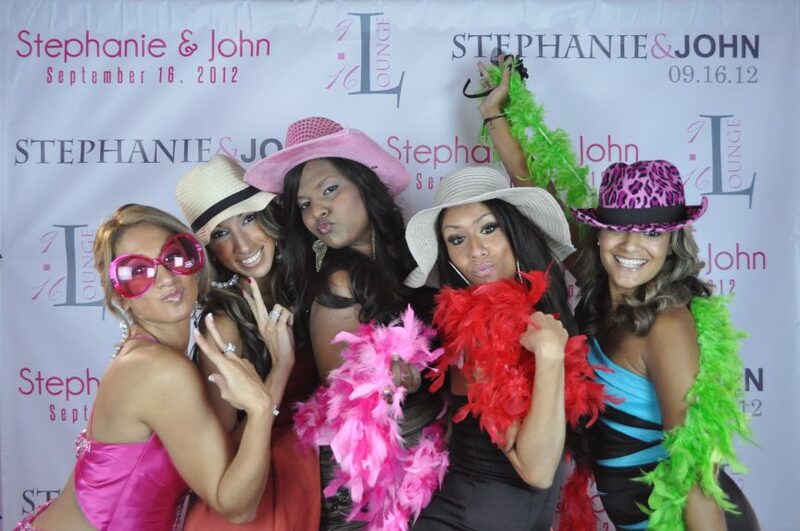 Jump into the photo booth & have some fun with your guests!